Group the projects with InLoox PM 7 according to the different criteria. This feature makes easier the project management and allows project information to be found quickly. Click the InLoox PM tab on the Outlook Ribbon and then Timeline. In Outlook 2003/2007, click InLoox PM Folder in the InLoox PM Toolbar and then Timeline in the InLoox PM project list. On the InLoox PM Ribbon, on the Start tab, in the Timeline details group, click Group. Group items by Choose a group field from the following groups: Start date, End date, Categories, Progress, Priority, Project number, Project name, Client or Fixed deadline. Then, the projects will be grouped by the selected field. Ascending / descending Choose if you want to group in ascending or descending order. Then by You have the option to group by four fields. 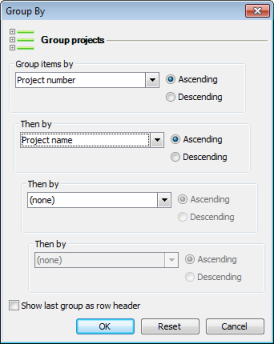 Show last group as row header This option creates a title column by the last group field. Click OK or Reset, if you don't want to save the changes. How to create project categories and assign them to a group | InLoox PM 7 • Copyright 1999-2019 © InLoox, Inc. All rights reserved.